This month's featured catfish is introduced by aficionado of African catfishes, Richard Broadbent. He's chosen to write this article in an innovative question and answer type style, and starts with the question, well, why this one? I'm revisiting a species that I don't currently keep. In fact I've not kept it for over fifteen years. Why then, I hear you ask, have I gone for this species? Well I'll tell you: the other weekend I saw a beautiful adult in a sump tank at a local Maidenhead Aquatics and priced as a bargain. 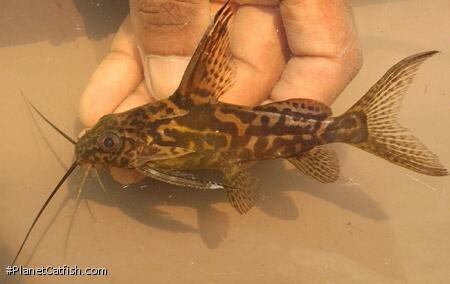 It was offered under the general heading of 'assorted synos' (where most were Synodontis nigrita or hybrids). This got me thinking about this species and this is one of those that, in the UK at least, are seldom seen these days compared to 15 to 20 years ago. History & where we are today. Way back in the day, a good fish retailer would have some synos in stock. They might have any of the following (but typically only single fish): S. notata, S. schoutedeni, S. alberti, S. njassae, S. multipunctatus / S. grandiops, S. acanthomias, S. brichardi, S. schall, S. decora, S. pleurops, S. ocellifer, S. waterloti and of course S. greshoffi. If you encountered a S. angelica or S. flavitaeniatus, you fell instantly in love until you found out how much it would cost you! Fast forward and now you can go into a store and find a tank full of S. flavitaeniatus for less than a tenner (£10) each — the same has been seen for others in my list but there isn't a sniff of S. greshoffi to be seen anywhere. This is generally true for some other species; so whilst some species are much more available, some crackers have been all but lost. Ok it's not spectacular, but it is a pleasing goldy-brown or drab olive with darker body marbling, which is finer on the head; sometimes being more speckled than marbled. It is almost like a less pronounced pattern of S. schoutedeni with broader bands of marbling. It could possibly be confused with S. waterloti (which has shorter barbles, a rounder snout and less pointed dorsal fin) and S. afrofischeri (which is darker and more slender) or S. schoutedeni (which has a more rounded head, and a bolder, finer more intricate body pattern). It has relatively long maxillary barbels that when back against the body reach the ventral fins. It isn't particularly aggressive in a group of mixed synos but it does get to just shy of a foot long so needs adequate space and shouldn't be kept in anything smaller than a 4x2x2 foot (120x60x60cm) tank realistically. How easy is it to keep? Size apart, this fish is not going to present any real problems. It will eat pretty much anything offered; both plant-based or more 'meaty substances' and in the wild eats quantities of insects, particularly aquatic larvae. I have not encountered any prepared branded food stick, flake or pellet it wouldn't eat. It is fairly peaceful given enough territory and lack of competition and adapts to a good range of water conditions. Typically its natural water conditions in the Congo basin can be replaced with a temperature of 23-27°c and pH 6.5-7.5 in the aquarium. I'll close by highlighting the opening question of this article: Why this one? Easy to keep, pleasing pattern and quite peaceful — what more could anyone want? Except, for now, for it to be more available! Type Locality Kinshasa, Stanley Pool, upper Congo River near Brazzaville, Democratic Republic of Congo. Distribution Africa: Congo basin, except Luapula River system and Lower Congo.